- the official website of Michael Turner and Graham Turner, bringing you their Motorsport, Aviation, Medieval and Military Art, direct from the artists. 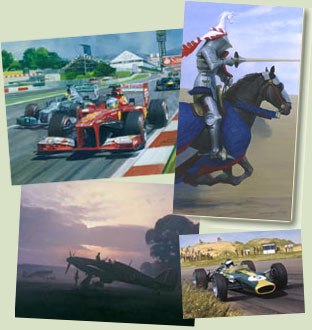 Studio 88 was formed in 1963 by Michael Turner and his wife Helen, to publish prints and cards from his Motor Sport and Aviation paintings, and Graham Turner's work has been published alongside his father's for the past thirty years, broadening our range to include his acclaimed Medieval and Military art. Studio 88 is still very much a family business, being run today by Graham and his wife Anita. We hope you find something of interest on our site and look forward to hearing from you if we can be of assistance. CLICK HERE or on the button to the left to enter our Online Gallery, where you can find Prints, Greeting Cards, Original Paintings and more, all by Michael Turner and Graham Turner. A selection of our latest prints and cards etc. can be reached quickly by using the links below. Alternatively, browse through Studio 88's full range by clicking the 'Enter Gallery' button on the left, or use the search facility at the top of the page should you be looking for a specific subject. A soldier from the Calais garrison considers where his loyalty lies - with his king, Henry VI, or his captain, the Earl of Warwick. Ludlow Castle, Autumn 1459. 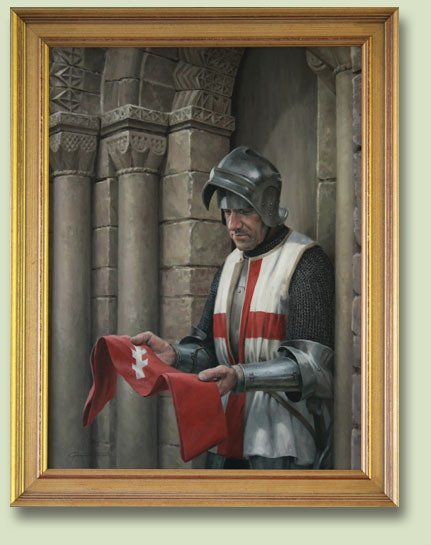 Graham Turner's latest oil on canvas highlights the complex shifting alliances that typify the Wars of the Roses, and how, although it is kings and nobles who dominate our history, their disagreements and power struggles affected ordinary people trying to survive in these uncertain and often violent times. CLICK HERE FOR FULL DETAILS of this new oil painting, which is now available for sale. 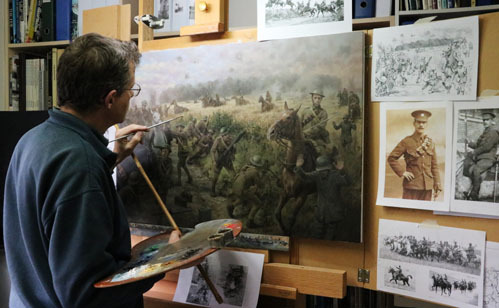 Animals have always been a part of Graham Turner's life, and his portrayals of horses in his historical paintings are often complemented for the life and realism they capture. A life-changing trip to Namibia in 2018 to work with and study the wildlife left him eager to record some of what he'd experienced on canvas, and the first four paintings resulting from that inspirational adventure are now offered for sale. 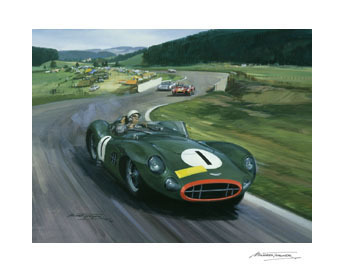 Another new addition to our range of high quality giclée prints is Michael Turner's painting of Stirling Moss in the winning Aston Martin DBR1 during the 1958 Nurburgring 1000 kms. 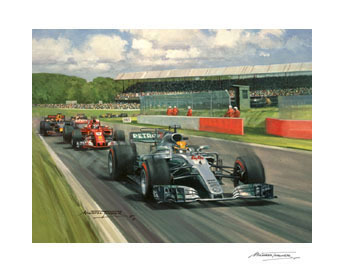 One of Michael Turner's latest paintings recalls a highlight of the 2017 Formula 1 season, the 2017 British Grand Prix at Silverstone. Lewis Hamilton in his Mercedes leads the field onto Hangar Straight in the opening laps, his victory here contributing to his fourth World Championship title. 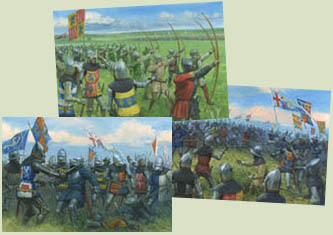 Three of Graham Turner's latest Wars of the Roses paintings are now available as prints - The Battle of Edgcote, The Pastons at the Battle of Barnet, and Bleak Outpost. Studio 88's giclée prints are individually printed on very high quality paper, artist signed, and available in a choice of sizes. A staunch supporter of the Lancastrian King Henry VI, Somerset's rivalry with the Duke of York was one of the causes of the Wars of the Roses. 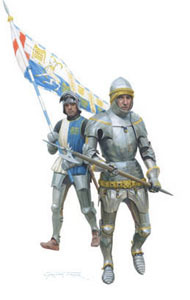 Their struggle for power and control of the King would escalate into open warfare at the battle of St. Albans in 1455, where Beaufort would meet his death. 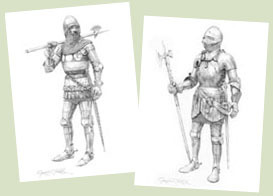 A range of prints reproduced from pencil drawings by Graham Turner showing 15th century armours, including a study of Richard III leading his household knights and retainers in their charge towards Henry Tudor at the height of the Battle of Bosworth. 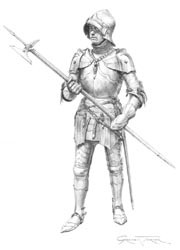 Pictured on the right is a drawing of an English armour c.1482, based on the memorial tomb effigy of Sir John Savile in Yorkshire. Please see our LATEST NEWS page for an announcement about Michael Turner's Motorsport Christmas Cards, which have been published every year since 1963, creating a unique pictorial record of over half a century of motor racing. Jim Clark, one of motor racing's greatest drivers, whose dominance of the sport saw him win two Formula One World Championship titles and score 25 victories out of 72 Grand Prix starts. 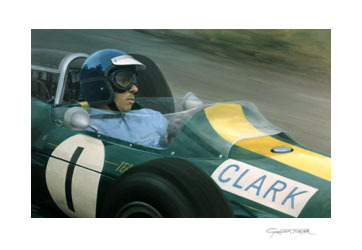 Graham Turners evocative painting captures the quiet genius behind the wheel of one of the green and yellow Lotus cars with which he was synonymous - the type 33 that he took to victory in five consecutive Grands Prix during the 1965 season. In July 2016, Graham Turner took part in a ride across the Somme battlefield to commemorate the centenery of the Charge at High Wood. 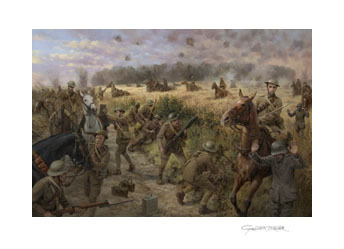 He has just completed this oil painting of the 7th Dragoon Guards returning from the charge and taking up a defensive position next to High Wood, commissioned by the grandson of one of the brave men of the regiment's Machine Gun Squadron who took part in the action. CLICK HERE for full details of this painting, and the story behind it, along with stage-by-stage photos of the painting in progress. Stirling Moss scored one of his greatest victories in the gruelling 1955 Mille Miglia, driving the fabulous 300SLR Mercedes. 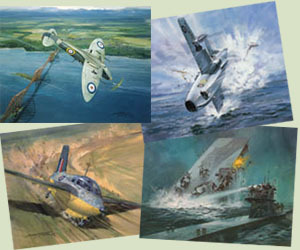 A collection of sixteen prints reproduced from Michael Turner's paintings recording significant episodes from the remarkable flying career of Eric 'Winkle' Brown and created in collaboration with this exceptional pilot just before his death in 2015. Graham Turner has recently completed three new original pencil drawings, and these are now available: Sir Walter Hungerford at the Battle of Agincourt, and English armours of c.1475 and c.1510. 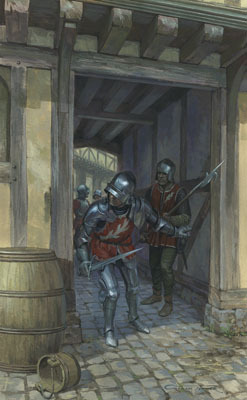 Soldiers in the Earl of Warwick's service advance through the back streets and alleys of St. Albans, to launch a surprise attack on Henry VI's forces in the market square during the first battle of the Wars of the Roses. CLICK HERE for full details of the original oil painting 'Replacements', which is also available for purchase. 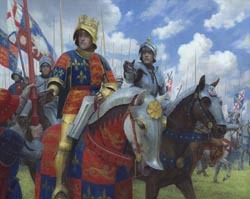 The Battle of Agincourt, a battle that pitted Henry V's small and exhausted army against the massed ranks of the French nobility, made icons of Henry V and the English longbowman, and became part of English national identity. Graham Turner's epic oil painting is available as a print on paper, and a special edition on canvas - CLICK HERE FOR FULL DETAILS. 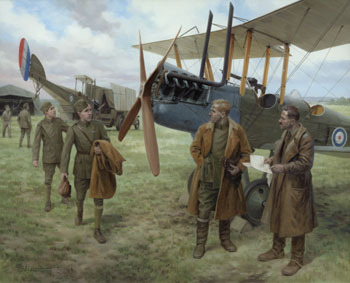 The original oil on canvas is now part of the Royal Armouries collection and on display at the Royal Armouries Museum. 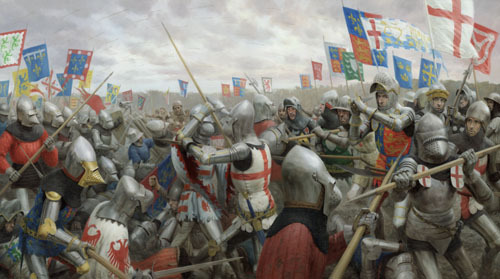 Graham Turner's acclaimed painting of Richard III at the Battle of Bosworth is available as a print, reproduced on paper or as a special canvas edition - CLICK HERE FOR DETAILS.